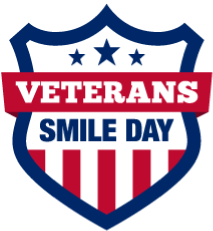 Veterans Smile Day - "Serving Those Who’ve Served"
The “Veterans Smile Day” mission is to provide free dental care and support to our military veterans as our small way of thanking them for their service. Our hope is that in the process, veteran’s will find a permanent dental home for themselves and their families. We need to open our doors—and hearts—to this very grateful population that deserves our help. They’ve kept us safe; the least we can do in response is to show our appreciation by doing what we do best. First of all, THANK YOU VERY MUCH for doing this great deed to help us veterans. This was my first time to come to your clinic and I was very impressed by the friendliness of your staff and the excellent service I received. (I'm sure all of the other Vets feel the same I hope). The Dr's and professional staff were very professional and told me what I need to do pertaining to my teeth and gums. Thank you again. I got there at 8:40 and was surprised by the number of veterans already lined up under the tent. I was greeted very courteous and prompt, as I also brought my paperwork already filled out with me. Coffee, doughnuts and bagels was a very nice surprise as well. I was properly taken care of, everyone was pleasant and it was a good experience. It was a free visit for Veterans but it was not complicated in any way. Looking forward to visiting you again. Although this is a large practice, you never feel like just a number. From the minute you walk in the door, you are greeted and your care is very personal as all of the staff greet you by name with a smile. The hygienists and doctors are good with adults and children and as parents juggling work, school and extracurricular activities for two young boys I am appreciative that I can make appointments together. Also, as a local in the community I praise the staff at Brickworks for their ongoing involvement in health and wellness through participation in hosting community events. I would highly recommended Brickworks Dental for their high quality medical care and friendly staff! Since 2012 our mission has been to serve the veterans in our communities with free dental care. Learn more about us and our mission to reach as many veterans as we can.